Stargazing is a major perk of camping in the back country under the vivid night sky. Void of city light pollution you can see the Milky Way and an array of stars and planets. Star gazers can get to know these heavenly bodies by using a star chart – either manual or as a cell phone app. Sadly, the city lights of Las Vegas have begun their encroachment on the night sky – even in Death Valley. We have seen the faint glow of Las Vegas along the horizon at times when in the Funeral Mountain Range on the eastern side of the National Park. 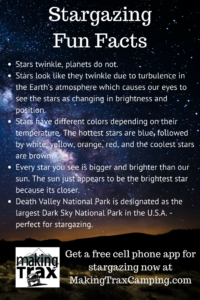 Death Valley National Park is designated as the largest Dark Sky National Park in the U.S.A. Death Valley’s natural darkness led the International Dark-Sky Association to designate the park as the third and largest International Dark Sky Park. “The Dark Sky Park designation represents not only the efforts of the park and its partners, but the dedication of avid amateur astronomers who have sought the park’s world-class starry skies for decades,” said Dan Duriscoe, of the National Park Service’s Natural Sounds and Night Skies Division. 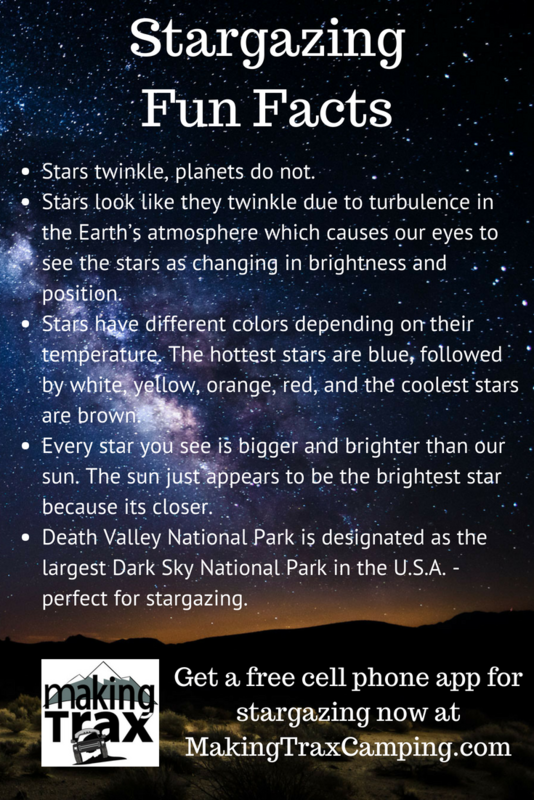 Read more about the dark sky observation opportunities from the park service. We always bring along a star chart/wheel so we can learn the names of the constellations in the dark velvet sky of the back country. These star charts come in various types and sizes so you can carry them backpacking, your truck’s glove box, or pack with your camping gear. This reliable tool does not need batteries or cell phone service and is an easy skill to learn. As you can see in our photo, these have been love worn like the Velveteen Rabbit. 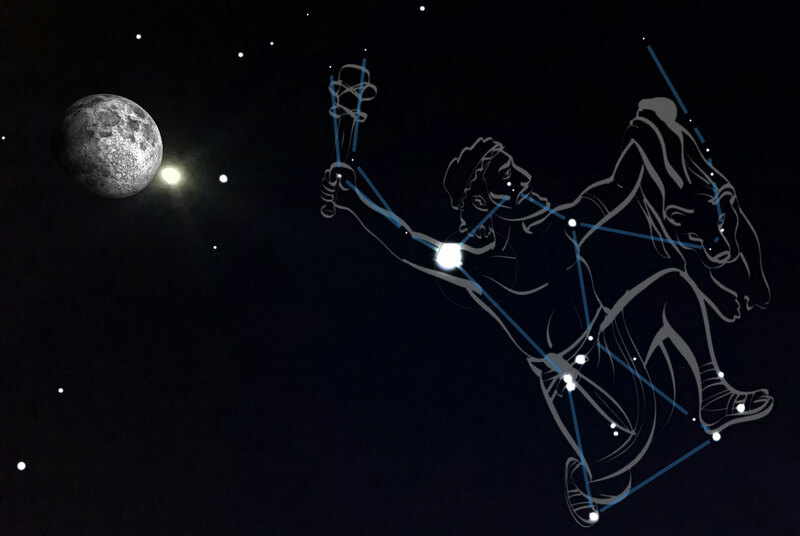 A favorite cell phone app we like is called, “SkyView”. This app uses the phone camera and your location. Simply point your phone towards a planet, star or constellation and its name will appear. Due to needing your location turned “on”, I have not yet tried to see if this app will work without cell reception in the back country. Get the app via Google Playstore or at this link. SkyView works with both iPhones and Android. The 88 constellations will appear transposed over the stars so you can recognize them. I have often wondered how certain constellations were drawn from the array of stars that seem to look nothing like the figure it represents. I guess it is like seeing shapes in the clouds that some folks see and others do not. Having a good pair of binoculars with a tri-pod is key to seeing more detail in the moon and stars. I have the Celestron Sky Master which are heavier than regular binoculars, but give better clarity to see craters on the moon and the rings of Saturn. I like using a tri-pod as it is hard to hold the heavier binoculars steady to gaze at objects so far away. Get a tall tri-pod so you can sit more comfortably without cramping your neck. Knowing the names of stars and planets is like knowing the names of wildflowers and canyons. When you know their names they feel like recognized friends, helping me to feel at “home” in new places. My personal favorite constellation is Orion. The “hunter” is easy to pick out of the night sky with his banded belt of 3 stars in the center of 4 bright stars in a rectangle forming his shoulders and legs. Orion also contains several nebulas. If you follow his top right shoulder up you will come to a tight cluster of stars called Pleiades or the 7 Sisters, also known as Orion’s kite. Orion can be seen best in the winter months. The Big Dipper is another favorite as it can be used to trace the ladle to find the North Star in the Little Dipper. Knowing the location of the North Star can be very handy in orienting yourself under the night sky. I recently discovered some interesting info about my zodiac sign, Cancer. The word Khan-Cer or Cancer, as the ancient Romans used it, means “The traveler’s resting place for the encircled.” Isn’t that what camping is? A resting place for the traveler, often using a fire circle. Becoming a star gazer will enrich your nights camping in the back country. What star gazing apps have you enjoyed using? Do you have a favorite constellation? How interesting! The cool thing about the Sky View app is it does not matter what time of day you are looking at the sky to see the planets and constellations on the app. It will even show you what is below the horizon. You must get to enjoy the aurora borealis light show in the darker months?! Wow I didn’t realize how bad our light pollution is getting! 🙁 Thanks for sharing this to help inspire us to get out and see some dark places! Light Pollution has negative effects for people as well as various animals. i.e., sea turtles. 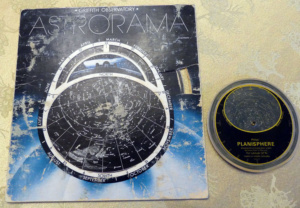 Anyway, this was really cool and makes me want to learn more about star systems and constellations. Your thought on how light pollution affects animals is interesting. I would think especially when it comes to the nocturnal creatures like bats, owls, skunks, etc.